Scottish Partnership Transport. SPT, designed a questionnaire and invited individuals to respond. In addition the CC sent out a survey to everyone on our Mailing list and also put a link on the website, plus some paper copies in the Wee Brae Shop on Manse Brae. The response was not overwhelming! The returns were collated and the results sent to SPT. Bring your antiques for Anita Manning and her team at Great Western Auctions to value. Items consigned to auction at a reduced rate. Tickets: £10 for three items. Tickets Available in advance, or on the door. between Junction 30 (Erskine) and Junction 29 (St James Interchange). Public meeting in Helensburgh to discuss the future of Health Services in our Area. Read more about on Lochside Press. Please take a moment to look here www.ukesdusoleil.com . If this link does not work, please copy it into your browser. Want to play the Ukelele? Louise is starting a new beginners ukulele class on Tuesdays at 2pm (45 minute class) . Starting on 2nd April. She has 2 spare ukuleles (first come first served). Guaranteed fun!! Please get in touch with Louise (louiseburnet@hotmail.com) if you are interested. Before launching on the next 50 in the Sandwich series , there will be a bit of a break. The intention is that concerts will probably resume sometime in 2020. So don't miss this concert! 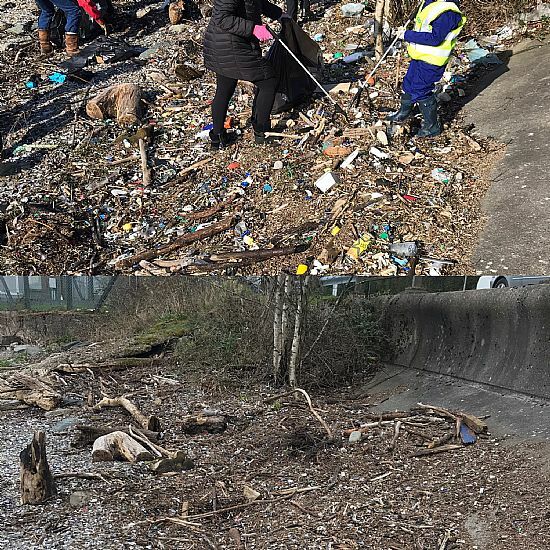 27 March 2019Beach Clean on Sunday March 31st. The Agenda and minutes of the last meeting, are posted on the Agenda and Minutes page of our website. Other reports will be posted as they arrive. Health and social care services across Greater Glasgow and Clyde are changing in response to increasing demand. They want to hear what matters most to people so that they can develop new ways of working to improve experience and outcomes and meet the challenges they face. At NHS Glasgow and Clyde 2017-18 Annual Review held today, Jackie Baillie asked me to encourage anyone who can to attend the meeting in Alexandria. Police Scotland is warning members of the public to be aware of a fraud which has recently resurfaced. A local resident was victim to a mobile telephone SIM fraud which resulted in the loss of a four figure sum of money. This is often referred to as SIM swap, SIM split or SIM interception attack. The first thing that can alert a victim of this type of fraud is that no service is available on their mobile telephone. The fraudsters bank on the fact that the owner of the mobile telephone does not question this for some time allowing sufficient time to commit the fraud. Only when contacting their respective service provider they discover that their number has been changed claiming a lost or damaged phone was the reason for the new SIM being issued. You can read more about this scan and many others on Neighbourhood Watch website. This includes veterans, their partners/spouses, widow or widowers and carers. The link above provides information of the services on offer from ASAP and also from Unforgotten Forces; a partnership of 15 leading organisations which offer support on access to health care, social isolation and respite. The school exclusion times are now 8.00-9.00 and 15.00-16.00 with the transports allowed from 6am to 7pm. This page will be updated further when we receive the information that we have requested from the Roads Department. Argyll & Bute Health and Social Care Partnership is undertaking research on type 2 diabetes to help inform its diabetes action plan. Through this survey they hope to learn more about public perceptions of type 2 diabetes, including what people know about how it can be prevented or effectively managed.They also hope to identify barriers that prevent people from accessing the right support services, and to hear their ideas about how support for people with type 2 diabetes and their families and carers can be improved. A new website to promote living and working in Argyll and Bute, has been launched. On the wall of the Blairvadach Outdoor Centre; the sign pointing to this is on a light pole on the A814. There is an App which you can download, shows the position of all defibrillators in Lomond and the Trossachs..
You will see from the minutes of the last meeting that there have been a couple of recent cases of flt-tipping on our patch. If you are a member of Rural Watch, and if you are not you should certainly think about joining, some serious flytipping took place in Glen Masson, near Dunnon which, because the information was circulated on the Rural Watch Network, an individual was arrested, charged and reported to the Procurator Fiscal for a contravention of the Environmental Protection Act 1990. This is the second time in recent months that Rural Watch has helped the police to apprehend criminals; the first was the theft of lead etc which had been stripped from an empty house. Please consider joining Rural Watch and be prepared to do your bit! Our fly-tippers were not apprehended! The Core Brief provides up-to-date information on a wide range of issues. Highlighting NHSGGC press releases and Scottish Government press releases on health. The above link gives information on the Health and Wellbeing Networks for Argyll and Bute. The Helensburgh branch meets regularly. Community Council member Linda Black represents the Community Council. Trining Courses availble for specialist workers. Help cut the amount of Landfill! Home from Home currently have reuse container arrangements in place with West Dunbartonshire Council at their Dalmoak and Old Kilpatrick facilities. These will be held on the last Sunday in every month, time dependant on tides! Details will be posted here and the forthcoming events will be highlighted in our Newsletter. Following a meeting with concerned residents, two members of the Community Council, Fiona Baker and Peter Knox, met with all parties involved with the extraction, except Argyll and Bute. Kirsty Robb - Ridings Sawmill, Cardross. Iain Catterwell, Argyll Timber Transport Group. The transportation of the Timber through the village of Rhu is governed by a TTMP which is a voluntary agreement between the timber extraction team and Argyll and Bute Council. It contains exclusion times when school children are likely to be on the road. The TTMP published on the A&B website is incorrect. It was changed in November but only our councillors were informed. The Tree Felling page on our website has been updated to reflect the latest information we have. Following the local incidences of Fly-grazing in our area, both Maurice Corry and Jackie Baillie tabled written parliamentary questions about Fly-grazing in Scotland. Mairi Gudgeon, Minister for Rural Affairs responded to say, essentially, that Scotland did not have a problem. This is a disappointing response, but our thanks go to Maurice and Jackie for raising the issue. You can read the questions and the resposes by clicking on the links below.